Shippensburg Borough municipal offices are located at 111 North Fayette Street, Shippensburg PA 17257; phone: 717-532-2147. Photo: Shippen House, ca. 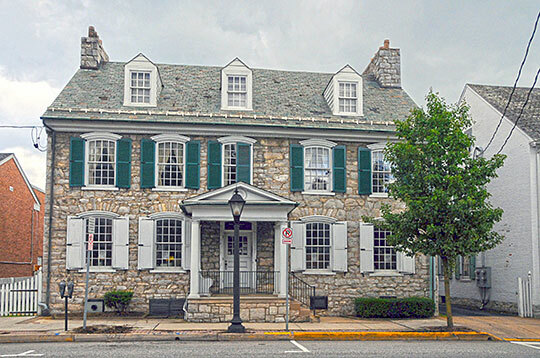 1750, 52 West King Street, Shippensburg, PA. Listed on the National Register of Historic Places in 1975. Photographed by user:Jerrye and Roy Klotz, MD, 2007, (own work) [cc-by-3.0 (creativecommons.org/licenses/by/3.0)], via Wikimedia Commons, accessed March, 2015. Pennsylvania's second settlement west of the Susquehanna River, Shippensburg was first occupied by Scots-Irish families from Lancaster and Chester counties. Situated at the intersection of two Indian paths, the South Mountain Trail and the Virginia Path, the settlement became a western trade center during its early years. A tavern, now known as the Widow Piper's Tavern, was built at the intersection of these two paths and helped establish an early commercial role for the settlement. In 1737 Edward Shippen, after whom Shippensburg was named, enhanced the settlement's commercial potential. Upon gaining possession of over 1300 acres in the area, Shippen began building an entrepreneurial base in the settlement. Promoting the growth of trade and transportation, Shippen encouraged a young merchant, Francis Campbell, to set up a new general store with Shippen involved, the town grew steadily during the 1740's. As with other western Pennsylvania settlements, the third quarter of the eighteenth century was not kind to Shippensburg. Problems with local Indians and the threat of attacks discouraged additional settlement. However, the troubles did have some positive effects upon the community. A fort was built in Shippensburg during the 1740's which offered local residents protection against roving bands of Tuscarora Indians. The fort helped solidify the town's social and economic roles within the region. Also, the hostilities brought about the creation of the Forbes-Burd Road. Surveyed by James Burd, the road provided the first reliable overland route to western Pennsylvania. In the late eighteenth century Shippensburg again experienced growth and expansion. After the Revolutionary War new settlers enhanced the town's commercial activity. As a result, a second town center developed at the intersection of King and Earl streets, thus giving Shippensburg two focal points. Because of these two centers, the town became an elongated, one street town reminiscent of the German strassendorf on "street city." With few exceptions, the buildings in this late eighteenth century town were common examples of the Georgian and Federal styles of architectural. Log, stone, and wood frame one and two story dwellings lined either side of King Street by 1800. Though not elaborate, the buildings reflected a well established, growing town. Schein, John R. Jr., and Doutrich, Paul E., Shippensburg Historic District, nomination document, 1984, National Park Service, National Register of Historic Places, Washington, D.C.